Field to Cup has provided me with the February Adventurer Box for the purposes of providing an honest review. I was very happy when Field to Cup reached out to me about trying their monthly subscription boxes. 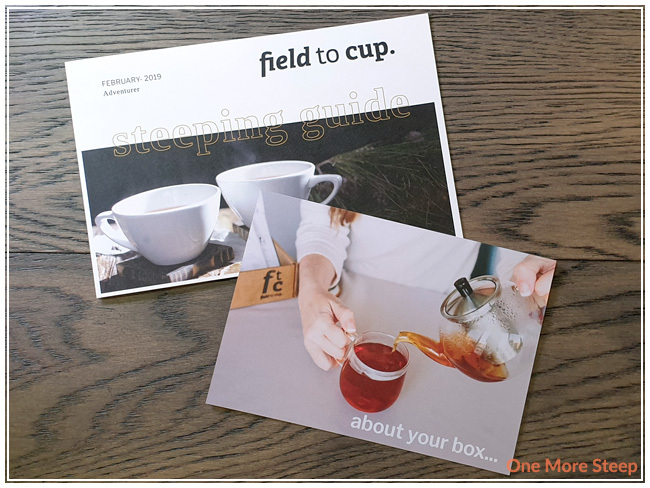 Field to Cup offers one-off or multi-month subscriptions (3, 6, and 12 months). The options are called Adventurer, Discoverer and Explorer. Discoverer and Explorer both have options of black or low-caffeine teas, while Adventurer is geared towards tea drinkers who enjoy straight teas, while also including some seasonal teas specifically chosen for each month. I opted to try the Adventurer box because I greatly enjoy straight teas. The inside of the cardboard box has a sticker that has some tips for making tea, as well as a handwritten note to me! Included as a card about the Adventurer box (4 teas each month, with 2 being premium/rare teas and seasonal teas included) from Haim and Shirley, who are the co-founders of Field to Cup. 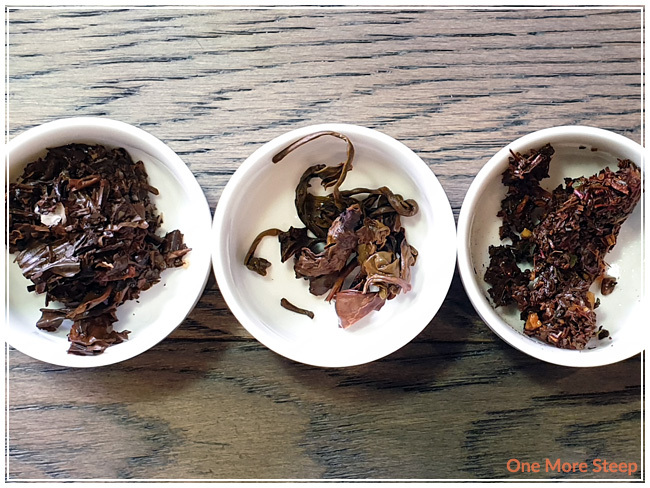 Also included is the steeping guide, which includes information for each tea in regards to how to steep each one, and tips on how to gauge water temperature if you don’t have a variable temperature kettle or thermometer. The February Adventurer box includes a bonus fifth tea, which is fitting for the season. 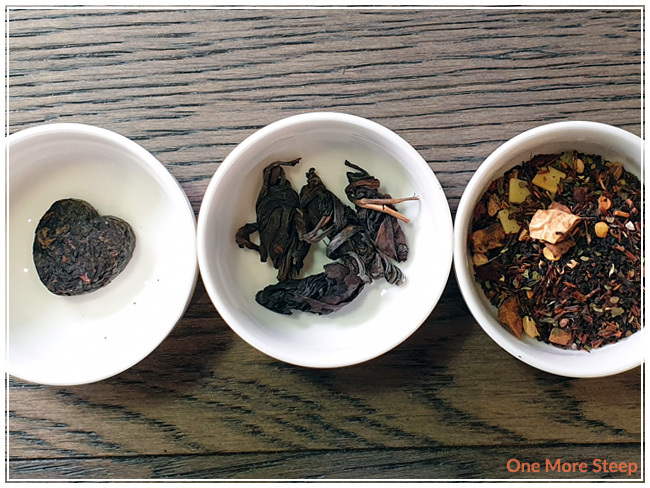 The teas in the February Adventurer box are: Blackened Heart (black tea), Hand-Rolled Delight (white tea), Mexican Hot Chocolate (black tea and rooibos blend), Organic Assam-azing (black tea), and Organic Darj-Oolong (oolong tea). 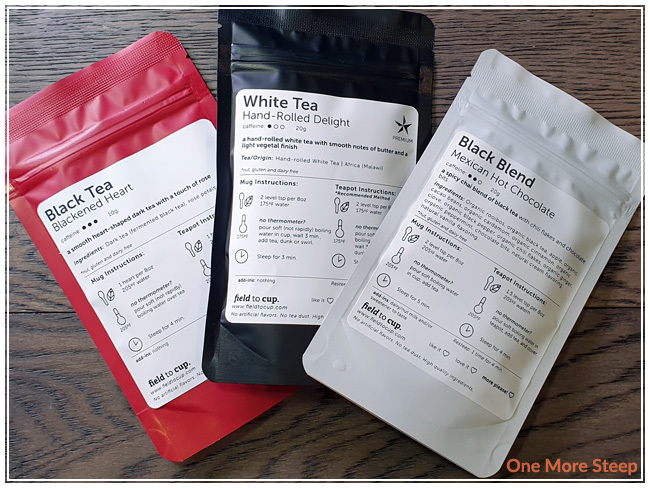 Each tea came in a sealed, resealable foil bag with a clear label on the front that includes details of tasting notes, ingredients, steeping instructions. Also included was a rolled stack of paper steeping pouches in the box. Blackened Heart is in a compressed, heart-shaped tea and the 10g bag had 3 hearts. The aroma is primarily that of roses. This tea consists of dark tea (fermented black tea), and rose petals. I’m most curious about how this one will look steeped when the heart opens up. Hand-Rolled Delight is a hand-rolled white tea from Africa. I found the leaves to be wiry, and almost feels like it’s been loosely rolled and twisted together. There’s a mild vegetal aroma, and slightly smokey in a way. Mexican Hot Chocolate is described as being a spicy blend, when I opened the bag I smell apples and cinnamon. This black and rooibos blend consists of: organic rooibos, organic black tea, apple, organic cacao beans, organic cardamom, organic cinnamon, organic clove, organic black pepper, organic chili flakes, organic ginger, organic peppermint, chocolate bits, natural cream flavouring and natural vanilla flavouring. From left to right: Blackened Heart, Hand-Rolled Delight, Mexican Hot Chocolate. Organic Assam-azing consists of black tea TGFOP1 from India, there’s a very mild aroma to the dry leaf. It smells a little bit malty. Organic Darj-Oolong consists of a partially fermented organic darjeeling from India. I found that the leaves to be a bit wiry, with a light floral aroma. 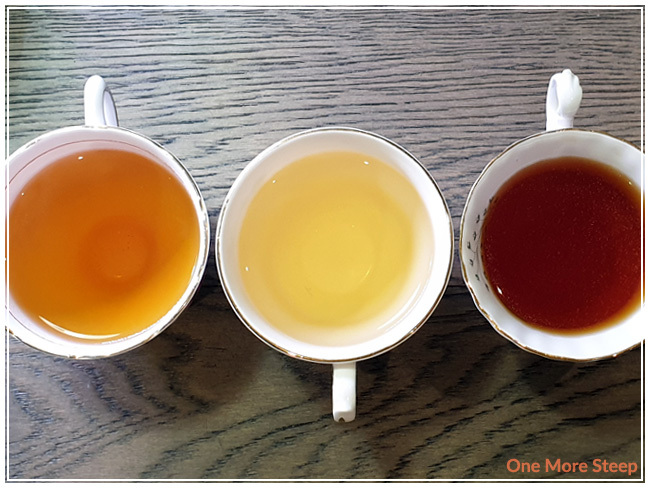 From left to right: Organic Assam-azing, Organic Darj-Oolong. Blackened Heart is recommended to steep 205°F (96°C) water for 4 minutes. My initial steep of Blackened Heart was in 200°F (93°C) water for 4 minutes. Hand-Rolled Delight is recommended to steep in 175°F (79°C) water for 2-3 minutes. My initial steep of Hand-Rolled Delight was in 175°F (79°C) water for 2 minutes. Mexican Hot Chocolate is recommended to steep in 205°F (96°C) water for 4-5 minutes. My initial steep of Mexican Hot Chocolate was in 200°F (93°C) water for 5 minutes. Organic Assam-azing is recommended to steep in 200°F (93°C) water for 2-2.5 minutes. My initial steep of Organic Assam-azing was in 200°F (93°C) water for 2 minutes. Organic Darj-Oolong is recommended to steep in 190°F (88°C) water for 2-3 minutes. My initial steep of Organic Darj-Oolong was in 185°F (85°C) water for 2 minutes. Blackened Heart steeps to a beautiful light orange. I found there to be an obvious rose aroma to the steeped tea. 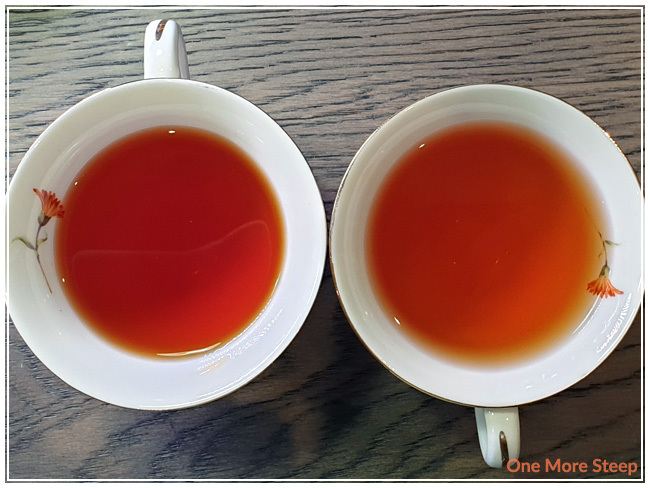 There’s a nice sweetness to the tea, but still floral and yet savoury all at the same time – I think that has to do with the fermented black tea in the heart. With the natural sweetness from the rose petals, I don’t think that it really needs any sweetener. Hand-Rolled Delight steeps to a light yellow colour. There are some buttery cream notes, with a light smokiness to it. I found it very pleasant and light on the flavour, which is starkly contrasting compared to the rest of the teas in this box. Mexican Hot Chocolate steeps to a deep brown, with a very obvious spicy aroma to it. I found that the flavour to be a bit sweet and I can definitely taste the heat of the chili. I don’t really taste any of the chocolate, unfortunately, but I do believe it is there because there’s a slight oil slick on the top from the melted chocolate that’s present in the blend. Fortunately, I don’t taste the rooibos base since I’m not usually a fan of it. Organic Assam-azing steeps to a dark golden brown. I found it to have a pleasant caramel flavour, although not as sweet as a true caramel. It also has a strong malty flavour to it, which I find to be quite typical of Assam black tea. Organic Darj-Oolong steeps to a slightly lighter golden brown, especially when compared to Organic Assam-azing. There are some nice floral notes, which make for a gentle sweetness in the tea. I found it to be very smooth and tasty. The tasting notes mention toasted cumin, but I don’t get that impression from my cup. I resteeped Blackened Heart three times, adding an extra 30 seconds for each subsequent steep. 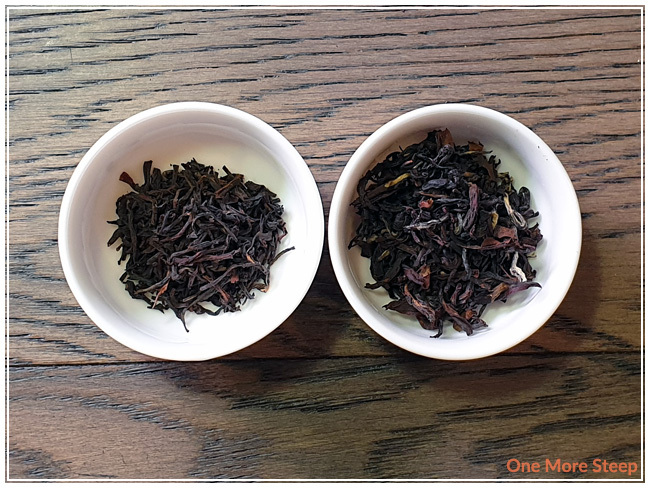 I found the flavour to remain fairly consistent throughout, but there was considerably less rose flavours by the third resteep, so I would recommend it for two resteeps. Hand-Rolled Delight resteeped quite well, I did two additional resteeps with the same leaves and found the flavour to be pleasant. I think a third resteep might be possible, but I found that the flavour in general for this white tea is quite light. I attempted to resteep Mexican Hot Chocolate once, and found that it didn’t taste as good as the initial steep. The spice level wasn’t as strong so it didn’t remind me as much of chili spices. Organic Assam-azing was resteeped twice, I found that each steep was similar to the initial steep – strong and malty. I enjoyed each resteep of this Assam tea. For Organic Darj-Oolong, I resteeped it twice. 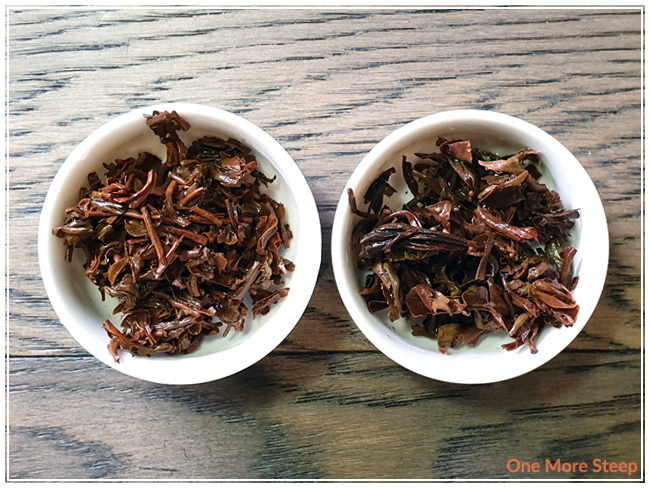 The floral notes and gentle sweetness were strongest for the first resteep, and the second resteep tasted fairly similar to the initial steep. I loved Field to Cup’s February Adventurer Box. I really enjoyed the variety of teas in this box – it’s quite nice that there’s a blend of straight teas with the seasonal blends. 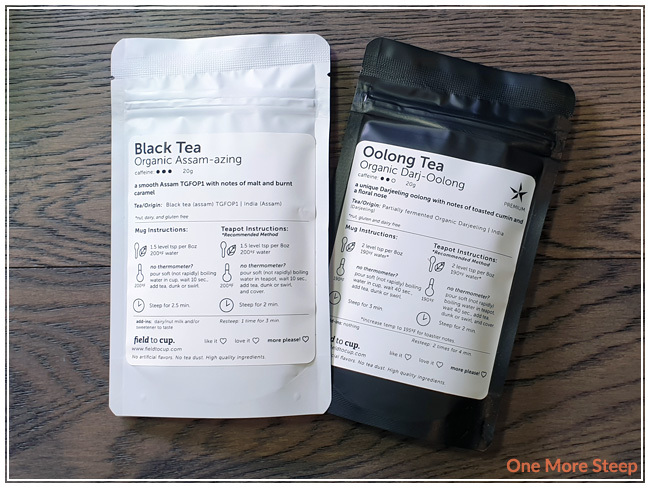 The packaging is very straight-forward and informative, it’s all tied together nicely with the steeping guide and the labels that provide so much information. 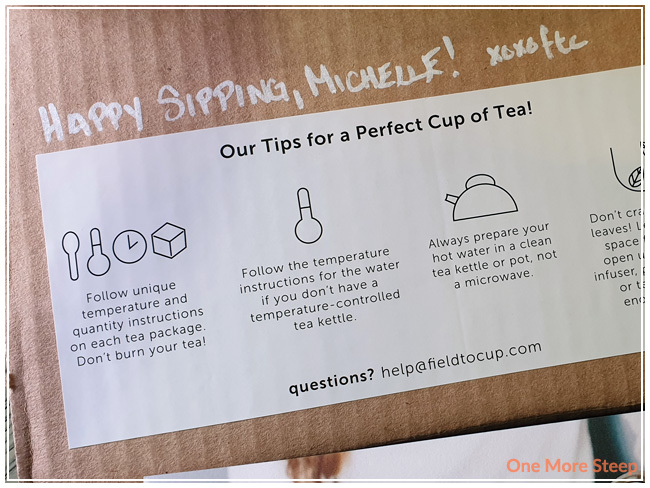 Field to Cup suggests that each box results in 4o to 72 cups of tea, depending on how many resteeps and leaves you use – and really makes the box affordable for how much tea you get in it. 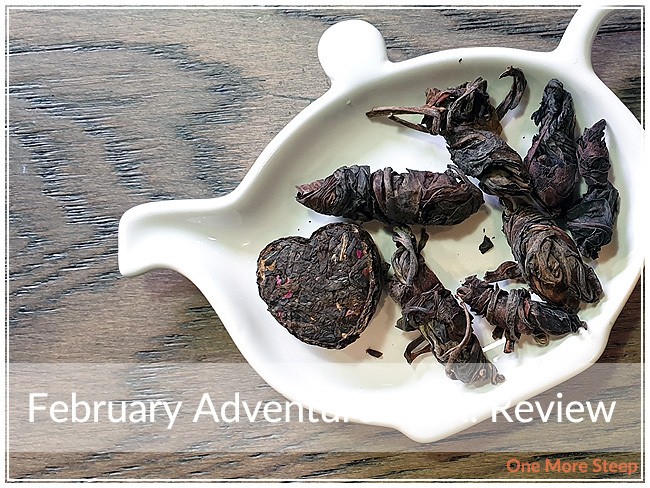 The February Adventurer box is 90g of tea, but most of the teas do really well with being resteeped, which just adds further value to the tea. My favourites in this box were the Blackened Heart and the Hand-Rolled Delight. I enjoyed your review of the Adventurer Box. I like that they have something that fits everyone and you get more than one or 2 cups of tea per tea along with resteeps. I received their Discoverer Black Box in January and did a review of them too. I’ve been hesitant to try tea subscriptions but my experience with Field to Cup has opened my mind up to trying and gifting their boxes.